Johnson Controls renews its commitment to veterans in 2015 for the second year. York distributors and contractors donate heating and cooling systems as part of Building Homes for Heroes® sponsorship. Johnson Controls, a global multi-industrial company, is extending its 2014 commitment to veterans into 2015 by renewing its sponsorship of the Building Homes for Heroes® program. Building Homes for Heroes is a national organization that recognizes the tremendous sacrifices of men and women of the United States Armed Forces by supporting the needs of severely wounded or disabled soldiers and their families. 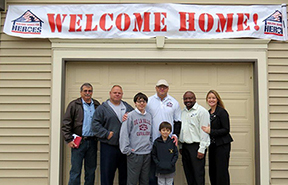 The Building Homes for Heroes initiative strives to build or renovate quality homes and gift the homes to these veterans nationwide, mortgage free. Johnson Controls first announced its sponsorship of Building Homes for Heroes in 2014, working with distributors and contractors nationwide to donate heating and cooling systems, including installation and labor costs, to 13 veterans and their families. The company recently committed to supporting 12 additional families in 2015. “All of us who have been involved with the Building Homes for Heroes program during the past year are thrilled to know that our relationship with the organization will continue this year,” said Liz Haggerty, vice president and general manager, Unitary Products Group at Johnson Controls. “What better way for us as a company to live out our commitment to the communities where we live and work than by supporting the brave men and women who made tremendous sacrifices on our behalf to protect our way of life in these same communities? To find a local York contractor and gain additional information about the Building Homes for Heroes sponsorship, visit www.york.com. Johnson Controls is a global diversified technology and industrial leader serving customers in more than 150 countries. Our 170,000 employees create quality products, services and solutions to optimize energy and operational efficiencies of buildings; lead-acid automotive batteries and advanced batteries for hybrid and electric vehicles; and interior systems for automobiles. Our commitment to sustainability dates back to our roots in 1885, with the invention of the first electric room thermostat. Through our growth strategies and by increasing market share we are committed to delivering value to shareholders and making our customers successful. In 2014, Corporate Responsibility Magazine recognized Johnson Controls as the #12 company in its annual “100 Best Corporate Citizens” list. For additional information, please visit http://www.johnsoncontrols.com or follow @johnsoncontrols on Twitter. Building Homes for Heroes®, Inc. recognizes the tremendous sacrifices of the men and women of the United States Armed Forces by supporting the needs of severely combat wounded or disabled soldiers and their families. It is a national organization committed to supporting these brave men and women, with a goal to build homes for families in dire need. For more information on these projects, please call 516-684-9220 or visit the organization’s website at www.buildinghomesforheroes.org.